12,000.000 music tracks from 3,000,000 albums by 1 545,000 artists legally and for free! With Audials One you can get 20,000,000 music tracks legally and for free! 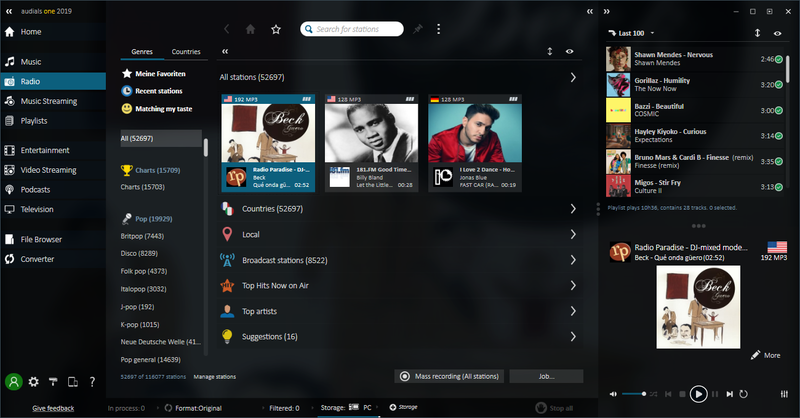 No other software fills your hard disk so quickly with the newest hits and the music you desire from 120 genres and every era. Only with Audials One do you get both your favorite artists as well as suggestions for similar music. Audials displays photos of bands and artists that are comparable to the musician you have entered. The artist directory offers an extensive selection with over 1,450,000 artists. Along with all the top 100,000 radio stations, Audials also provides you with the best international stations. 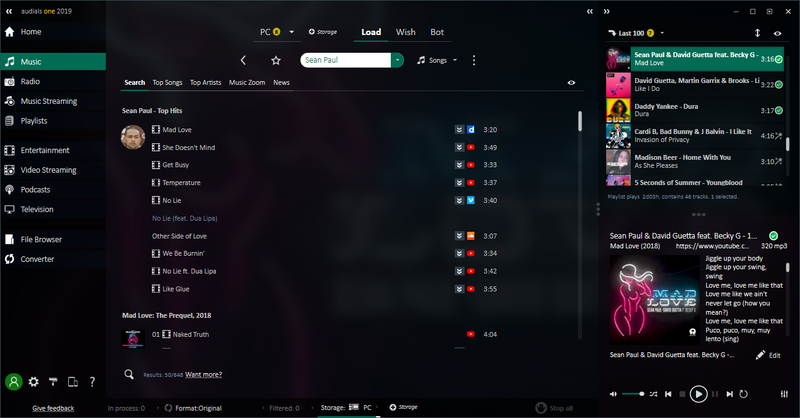 You can browse through stations in the conventional way according to music genres, countries, languages or locality. 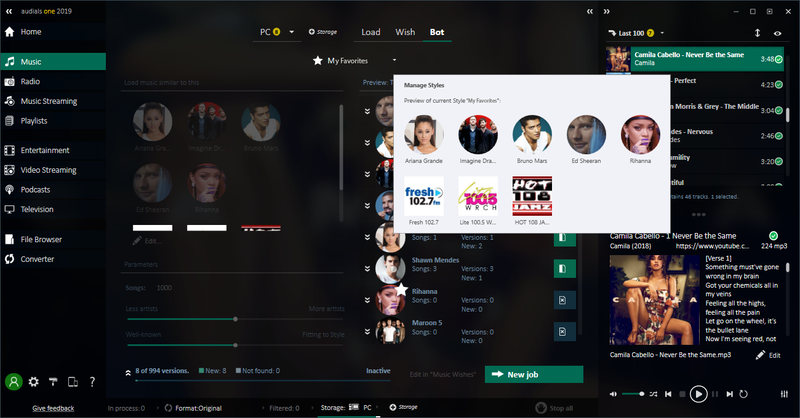 Or alternatively, you can find suitable radio stations quickly by entering your favourite artist into the dynamic search function. 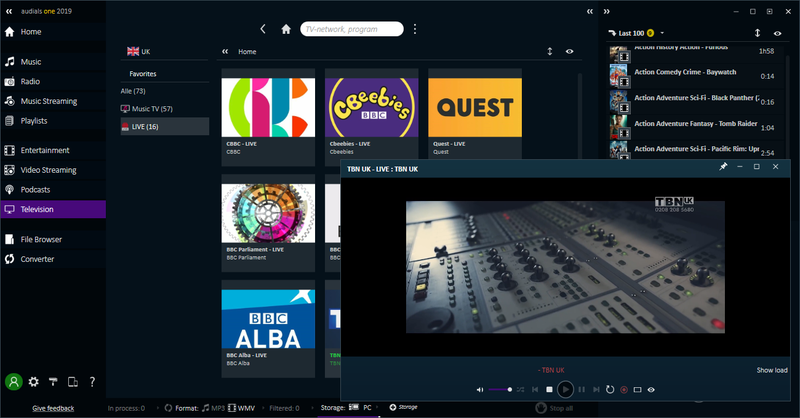 In Audials software, the optimal recording methods for the most popular video streaming services, video portals and media libraries come preconfigured. 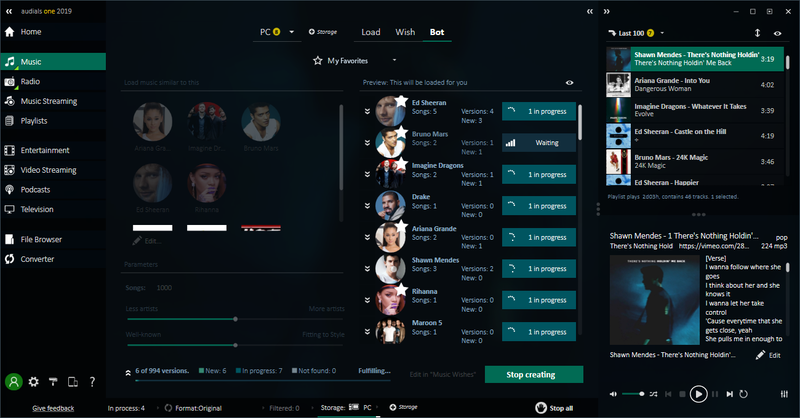 Simply click on the Audials tile for the desired video stream, then start the film and Audials records it in the video format you want and optimised for any device. Record and Archive All Episodes and Seasons of your Favorite TV Show from Amazon Video and Netflix Automatically! 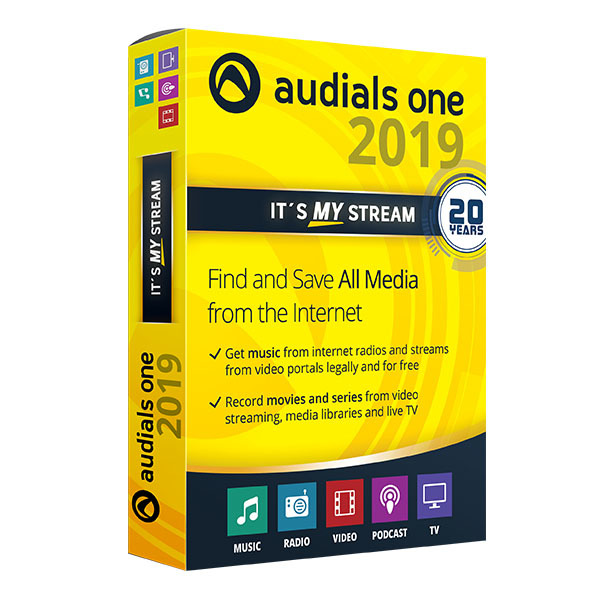 With Audials One, you can automatically record original programs and all other series from Amazon Instant Video or Netflix episode by episode using the new autoplay function in the video stream recorder. 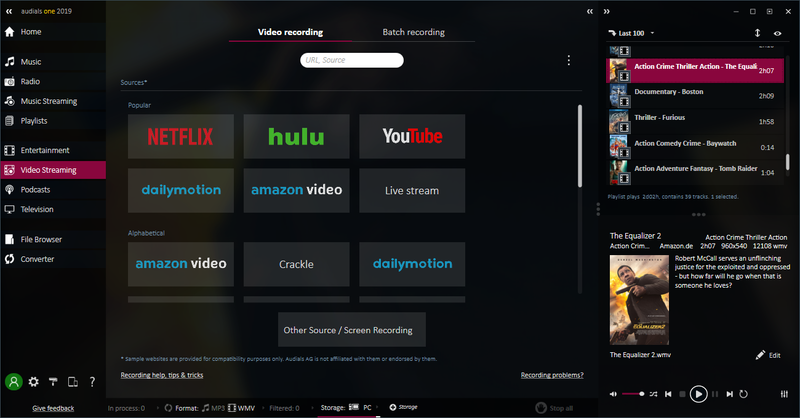 This allows you to save every season of your favorite TV show almost overnight. It works great with the Google Chrome browser for Amazon as well as Netflix. Music tracks from your music streaming services are recognised as music, recorded from the stream and automatically saved with tags. Whenever you listen to a song on a website or in the player of a streaming program, Audials can record it for you and automatically save it. Audials One has a unique innovation so that the quality of your music and audiobooks doesn´t suffer. With PerfectAudio we give you our promise of quality with a well-developed process that only allows for top results. There are 40 audio file formats to select from. Audials fulfills the highest of demands and enables you to calibrate for playback by adjusting for codec, medium, bitrate and frame rate as well as frame size to achieve the optimal result. You can do this, for example, for playing a film on a device with a special screen size or lower specs. Microsoft hasn’t provided any playback software in Windows 10. Therefore, Audials uses VLC player to enable users to watch and record a DVD simultaneously. Your Video Library - Organised Optimally! Your films are automatically structured according to category. Tagged films are automatically sorted into a folder with the corresponding film genre. This means that with each new film added, your own personal video library is automatically expanded. You can also manually add folders for your favourite actors or directors or, if a film has more than one part, put all the parts together in a special separate folder. Instead of seeing only a film title or a file name, you can now browse through your video collection by film cover image to select and play the video you want. Audials fills up your smartphone or tablet either directly via USB cable or via the Internet from the cloud. 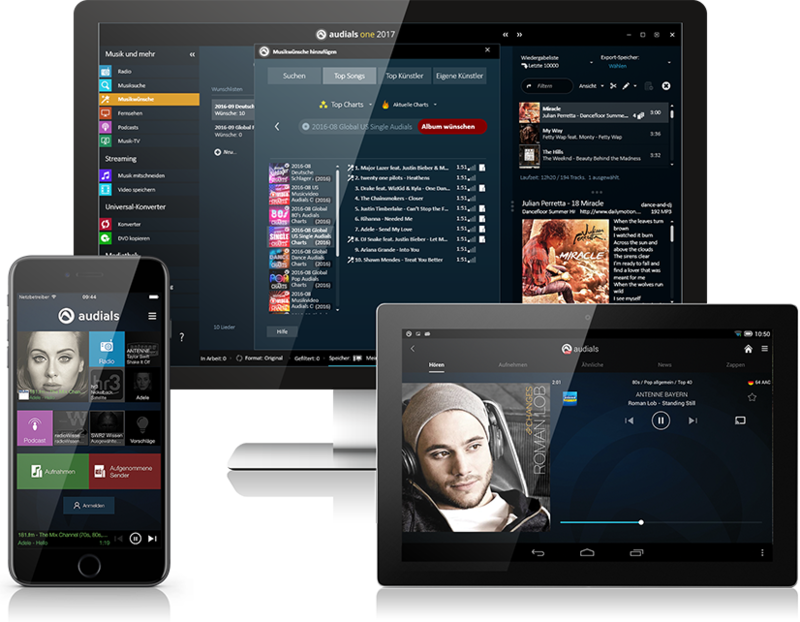 AudialsOne is solely to be used to record music for personal use from legal online radio and social radio stations only.